Cadbury Mini Eggs make this a special treat for Easter time. To make Gluten-free: Substitute the flour with 2 cups GF flour blend + 1/2 tsp Xanthan Gum. Follow everything else as is. (Photo shown is the GF variety - yummy! 1. Preheat oven to 350 degrees. Grease a 9x13 inch baking pan with non-stick spray. Set aside. 2. In a medium bowl, whisk together flour, baking powder and salt. In the bowl of a stand mixer, cream together butter and sugar until light and fluffy. Add eggs, one at a time, beating briefly between each egg. Add vanilla and beat for an addition 30 seconds. 3. With the mixer on low, slowly add the dry ingredients to the mixer bowl. Beat until ingredients are just combined. 4. Using a sturdy wooden spoon or spatula, fold in half of the Cadbury Mini Eggs, half of mini marshmallows, half of the dark chocolate chips and half of the white chocolate chips. The dough will be very stiff. 5. Spread cookie dough evenly into the prepared baking pan. 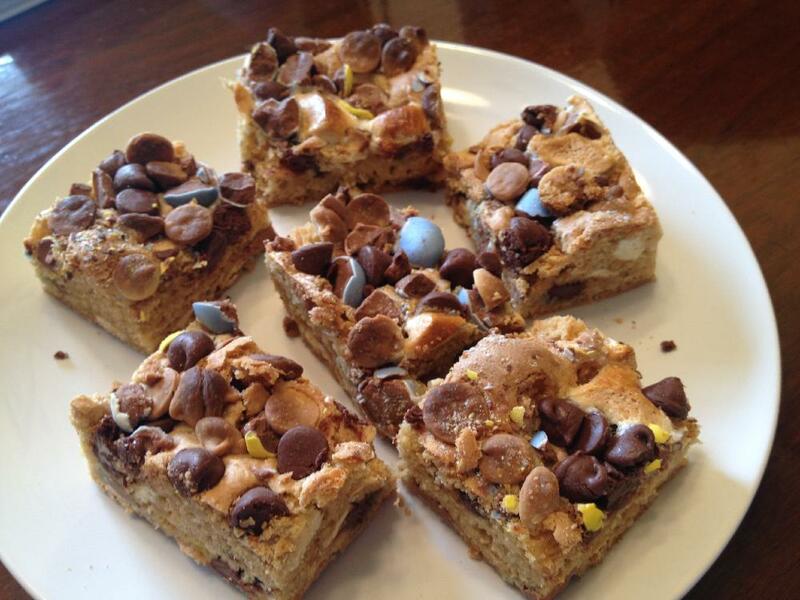 Sprinkle the top of the cookie dough with the remaining Cadbury Mini Eggs, marshmallows, and both kinds of chocolate chips. 6. Bake cookie bars for about 35 minutes or until the top is golden brown and a toothpick inserted into the cookie bars comes out clean.